Have you had cast iron grates stolen or corroded due to caustic conditions? Light weight and Strong - Use molded grating where heavy loads (such as fork truck traffic) are encountered. Corrosion and Chemical Resistant - Non-permeable material that will not absorb and hold odors. Restaurants love fiberglass grating for their kitchens for sanitary conditions. Ability to fabricate to custom sizes - Covering the odd length and width is not an issue. Low thermal and electrical conductivity - Safer in volatile environments. No metal scrap value - Thieves will leave it alone. Micro-mesh: A molded fiberglass with ¾ inch opens built on a 1.5" x 1.5" frame. It comes in 1" and 1.5" thicknesses. Micro-mesh can be made with or without a slip resistant coating. Open area for Micro-mesh is 44%. The weight is 2.9 lbs per square foot for the 1" thick mesh and 4.5 lbs per square foot for the 1.5" thick mesh. Micro-mesh is available in light gray and dark gray. Square Mesh Grating: Molded mesh grating is one of the most common types of fiberglass grating. It is available in a 1", 1.5" and 2" square mesh. Thicknesses vary from ½" to 2". And, resin types can be varied to meet your corrosion and fire resistant needs. 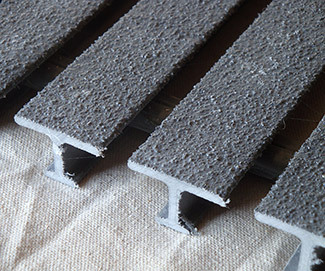 For standard trench drain applications, polyester resins are used most often. Open areas for mesh grating range from 58% – 87%. High Load Capacity (HLC): High load capacity molded grating is commonly used in applications where heavy loads (such as fork truck traffic) are encountered in corrosive environments. Also, HLC grating has been used in areas where cast iron grates are prone to theft, as they have no metal scrap value. HLC mesh (1" x 2") is made with high strength vinyl ester resins and come in 1.5" and 2" thicknesses. Non-slip surface coatings are available." Open area is 48%. Grating weights are 6.2 and 8.4 pounds per square foot, respectively. Pultrusion is a fiberglass forming process whereby reinforcing fibers are pulled through an extrusion die while vinyl ester polymer resins are extruded under pressure. The act of “pulling” fiber while “extruding” resin leads to the term “pultrusion”. Fiberglass shapes made by this process come in long, continuous shapes. In the case of fiberglass grating, the shapes have cross-section akin to rectangular bars, tees and I’s. To make bar grating, these long bars are assemble parallel to each other and connected by structural cross members (known as tie bars) on 6" spacing. A non-slip coating is applied to the grating after assembly. I-Bar Grating: Available in 1" and 1.5" heights, I-Bar load bar spacing is on 1", 1.5" and 2" spacing, which also defines the open area of the grating. I-Bar grating that have load bars on a 1" spacing (I4010 and I4015) are ADA approved with 40% open area." I-Bar grating is available in polyester resin (yellow) and vinyl ester resin (dark gray). T-Bar Grating: This type of bar grating is especially good for pedestrian surfaces that need to be ADA approved. It is available in 1", 1.5" and 2" bar thicknesses. Open area is mostly under 40%. T-Bar grating is available in 12% open area with a fine slip resistant coating that is used in water parks and boat dock decking. High Strength I-Bar Grating: I-Bar grating is available for use in applications where heavy loads will be experienced. Available in 47% and 58% open area (1.19" and 1.5" bar spacing), high load capacity bar grating is made in 1", 1.5", 2.0" and 3" thicknesses. Slip resistant coatings are a standard feature for this product. 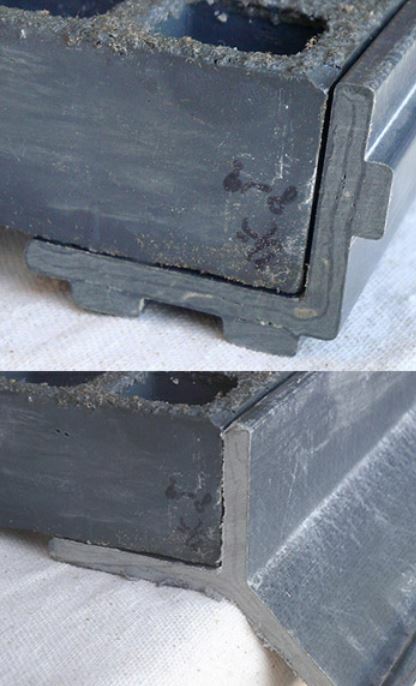 The pultrusion process is also used to manufacture fiberglass frames. We offer two frame styles to use with your grating. Stainless steel clips are also available to secure your grates when installed. EZ Frame – Available in 1", 1.5" and 2" setting surfaces, EZ Frame has a set of low profile anchor built in to help lock it securely into concrete during frame installation. 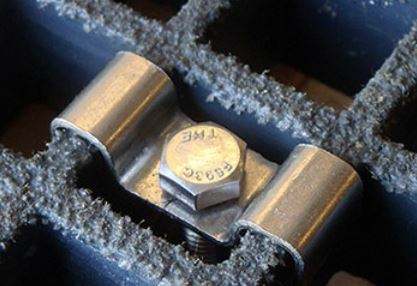 Y-embed Frame – Available in 1", 1.5" and 2" setting surfaces, the Y-embed frame has the tried and true, traditional anchoring system that uses the “Y” shape to lock the frames into your concrete pour. Grating Hold-down Clips – Stainless Steel (316SS) clips are made to lock-down each of the fiberglass grating types offered by Trench Drain Systems. Type R and E Hold Down clips are made for I-Bar and T-Bar pultruded grating. Type M clips are used with standard mesh grating. Spring clips are available for applications where grates need to be removed and reinstalled without the use of hand tools. Get a quote now to replace your old and rusty trench grate with a new Fiberglass Grate! Please include grate dimensions in the detail box.